Are These High-Sugar Foods Ruining Your Beach Body? Think you're eating healthy to prepare for summer? Think again. You may be sabotaging your goals with these sugary foods. "Healthy" and "low-sugar" foods are popping up left and right in the supermarket. And thanks to crafty manufacturers who display colorful packaging and bend the rules governing nutrition labels, an innocent-looking, nutrient-rich food may in fact be chock-full of sugar. It's clear food manufacturers will go to great lengths to get you to buy their foods—even if it means loading up otherwise healthy foods with inordinate amounts of sugar. Here are four such foods to be aware of! Craftily positioned as a convenient way to flood your body with healthy nutrition, bottled veggie-fruit-fusion drinks have fast become a mainstay at grocers and even coffee shops. Yet, what is in that bottle can be so much more than kale, beets, or carrots. While some brands are upping the game by infusing drinks with everything from protein powder to probiotics, they are also using a heavy hand when it comes to fast-digesting sugary carbs. Sugar has many different names. When you see ingredients such as organic pear juice from concentrate, apple-juice concentrate, or evaporated cane sugar, know that they're code names for more sugar. Clearly, any benefit from the small amount of greens in the product is being greatly tempered by the sugar deluge—16 grams in a half-bottle serving for many! And who stops at just drinking half a bottle? Our advice: Veggie drinks can provide a payload of body-friendly nutrients, but only if the brand you choose places vegetables and perhaps whole fruits (not fruit juice) predominantly in the ingredient list, and contains a minimum of sugar. Or forget these, and look for ways to incorporate vegetables into your homemade protein shakes. Spinach smoothie, anyone? Just because it's green doesn't mean it's healthy. To skip the hidden sugar, make your own veggie smoothies. Who would have thought that this staff of life could be aiding and abetting the sugar onslaught? Yes, commercial bread, and even those touting their whole-grain benefits, can have quite a few grams of added sugar in each slice. Presumably, this is to help the bread brown better when toasted and extend its shelf life, but it's added sugar nonetheless. Also watch out for rye breads, which can be mostly processed wheat flour with caramel or molasses added for a coloring effect. Our advice: You don't have to give up your lunch sandwiches—just seek out loaves without added sweeteners like high-fructose corn syrup or honey in their ingredient list. Bread claiming to be 100 percent whole-wheat offers no guarantee that it's 100 percent free of the added sweetener. Bread from local artisan bakers is less likely to be made using sugar, but be sure to ask the person covered in flour to double-check. Few foods have benefited from a health halo more than granola. But if you aren't careful, you could be serving up glorified candy in a bowl for breakfast. While many granola brands supply good stuff like oats and nuts, they can also bombard your body with plenty of sweetness courtesy of sugar-coated dried fruits and added sweeteners like evaporated cane juice and brown sugar. A mere half-cup serving can contain 15 grams of sugar or more! And who just eats a half-cup serving? Our advice: To scoop up a granola that is less likely to mess with your buff-to-blubber ratio, turn over the box or bag and read the nutrition numbers. Ideally, you're looking for a brand that delivers no more than 10 grams of sugar per half-cup serving and at least 3 grams of dietary fiber. Words like "maple," "chocolate," and "honey" on the label should be a tipoff to its sugary ways. Another option is muesli. It's also made with oats, nuts and often dried fruits, but it's easier to find muesli with lower sugar numbers or a version not sweetened at all. 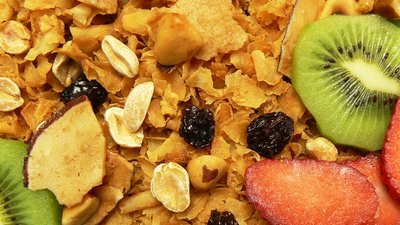 Although it's often touted as "natural," granola has more added sugar than many children's cereals. By now, you have probably heard about the health-hiking benefits that the antioxidants in chocolate can deliver. For example, a Journal of Nutrition study showed that frequent consumption of flavonoid antioxidants in cocoa may support blood pressure and cholesterol numbers already in healthy range. That makes dark chocolate an even more delicious treat. But to get the most bang for your buck, you need to choose a product that is a lot more cocoa than sugar. Unfortunately, there is no regulation over the term "dark chocolate." What might seem like a virtuous cheat food can supply more sugar than you'd suspect if your dark chocolate isn't so dark after all. Our advice: For a bar with a better antioxidant-to-sugar ratio, select one that lists cocoa before sugar on its ingredient list. Another way to ensure that you're loading up on more healthy antioxidants than added sugar is to select a bar which states a cocoa percentage of at least 70 percent. Ideally, work your way up to a bar containing 80-85 percent cocoa. Shrime, M. G., Bauer, S. R., McDonald, A. C., Chowdhury, N. H., Coltart, C. E., & Ding, E. L. (2011). Flavonoid-rich cocoa consumption affects multiple cardiovascular risk factors in a meta-analysis of short-term studies. The Journal of Nutrition, 141(11), 1982-1988.